Male, 20 to 30 years old; At least 5’5” in height; With at least 6 months of experience in similar job; Must be hardworking; Can work under pressure and with limited supervision. Male/Female, 25 to 40 years old; At least 5’7” in height; Must be a graduate of BS in Criminology; With valid security license or equivalent; Must be computer literate; Must be of good moral character; Must pass a medical examination and drug testing; Must be physically and mentally fit. Male, 25 to 39 years old; Must possess at least a bachelor’s/college degree in Industrial Technology or equivalent; With at least 2 years of experience as AutoCAD Designer; Has competent computer skills, with the ability to produce 2D/3D drawings; Can work under pressure and with limited supervision. Male/Female, not more than 27 years old; Graduate of BS in Computer Engineering/ Information Technology or Electronics and Communications Engineering; Has good analytical, interpersonal and communication skills; Must be computer literate; Must be flexible, assertive and highly trainable; Can work under pressure and with limited supervision; ; Must be willing to render overtime work even on weekends and holidays. Male, not more than 30 years old; At least college level, or with vocational diploma; With experience in spray painting in a manufacturing company; Must be willing to render overtime work even on Sundays and holidays. Male, at least 20 years old; Must possess at least a high school diploma; With at least 2 years of experience as Mechanic in a manufacturing company; Has good verbal and written communication skills, both in English and Tagalog; With electrical or mechanical dexterity; Must be proficient with common hand and power tools; Must be of good moral character; Must be physically fit; Can work under limited supervision. Female, 23 to 33 years old; Graduate of BS in Accountancy or other 4-year relevant courses; With or without experience. Male, at least 26 years old; With pleasing personality; With experience in similar role and other hotel operations; Preferably with training in good housekeeping; Has good verbal and written English communication skills; Must be computer literate; Must be willing to work on shifting schedule. HITACHI AIR CONDITIONING PRODUCTS (PHILS. ), INC.
Male/Female, 21 to 30 years old; Must be a graduate of BS in Mechanical Engineering; With good knowledge of air-conditioning systems is an advantage; Must be computer literate; Must be hardworking; Can handle work pressures; Must be willing to render overtime work. 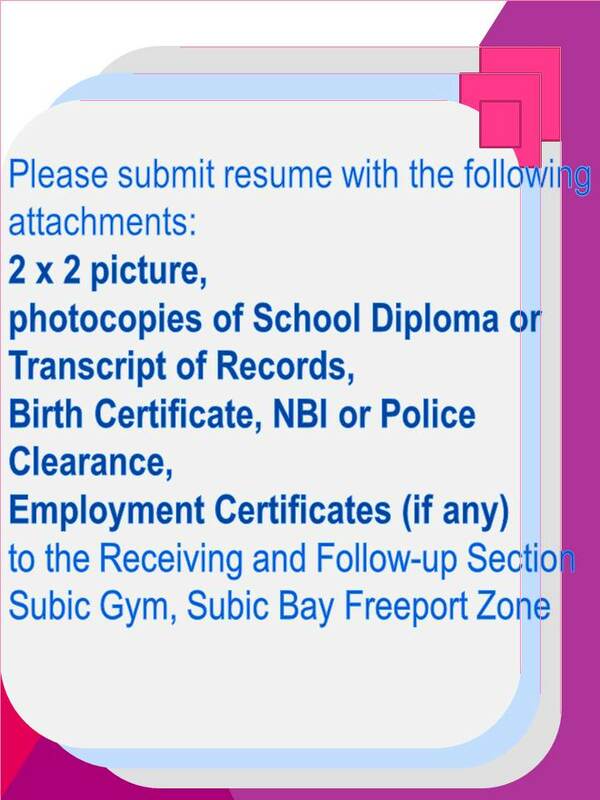 Candidate must possess at least a high school diploma; With at least 1 to 2 years of vehicular driving experience; Can drive/operate 4-wheeled trucks; With knowledge of basic mechanical maintenance and repairs of vehicles; Must be familiar of Greater Manila Areas; Must be honest and trustworthy; Must be willing to work on a graveyard shift. Male/Female, not more than 30 years old; Must be a graduate of BS in Accountancy; Has good interpersonal and communication skills; Must be computer literate, with average keyboarding skills; Must be articulate and flexible; Can work under pressure and on extended hours. EZSET TONG LUNG (PHILS.) METAL INDUSTRY CO, INC. Female; At least college level or graduate of any 4-year courses; With experience in managing ISO document/procedure and document control center; Has good communication and computer skills; Must be proficient with MS Office programs; Must be organized, attentive to details and a team player; Must be capable of handling work pressures and multiple tasks; Ready to undergo medical exam if required. Male/Female; Preferably a holder of a bachelor’s/college degree relevant to or major in Sciences; With at least 5 years of work experience, including 2 years as QC Engineer/Technician; Has good verbal and written communication skills; Can understand geometry and measurement such as caliper, etc. ; Can understand ISO9001 quality management system; With 6sigma, QS-9000/TS16949 and lean manufacturing training is more desirable. Male/Female; Preferably a holder of a bachelor’s/college degree relevant to or major in Sciences; With at least 3 years of work experience, including 1 year as a QC Technician; Has good verbal and written communication skills; Can understand geometry and measurement such as caliper, etc. Male, not more than 40 years old; Graduate of Culinary Arts or other 4-year relevant courses; With at least 5 years of experience as Head Chef in a fine dining restaurant. Male/Female, not more than 25 years old; Must possess an associate/bachelor’s degree in Hotel & Restaurant Management; With at least 6 months of relevant work experience. Male/Female, not more than 30 years old; Must possess an associate/bachelor’s degree in Hotel & Restaurant Management; With or without work experience. Male, not more than 30 years old; Must possess an associate/bachelor’s degree in Hotel & Restaurant Management; With or without work experience; With driving skills is an advantage. Male/Female, not more than 40 years old; Must possess at least an associate degree; With at least 1 year experience as Cook.